Refugees: What Would Mr. Rogers Think? 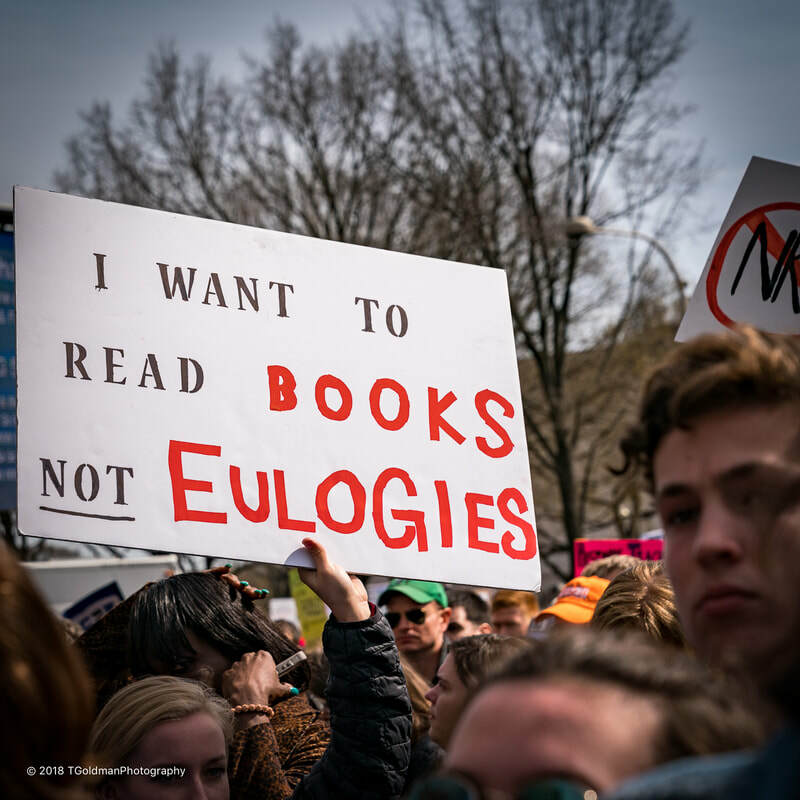 March For Our Lives: Am I Next? 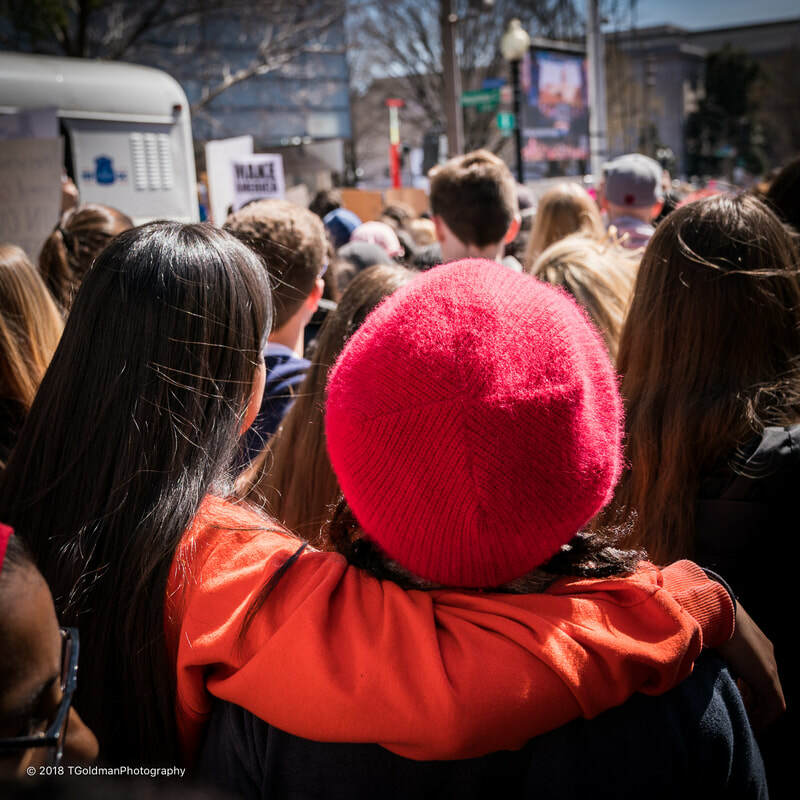 ​As with the Women’s March On Washington on January 21, 2017, I was called to Washington DC for the March For Our Lives on March 24, 2017. If I had watched on TV I would have a had better appreciation for the speeches. But I needed to see the people and their signs, to experience the electric energy, and of course to take pictures. Everyone who has shown interest in the events following the massacre at the Marjory Stoneman Douglas High School in Parkland, Florida, knows the story better than I can tell it. 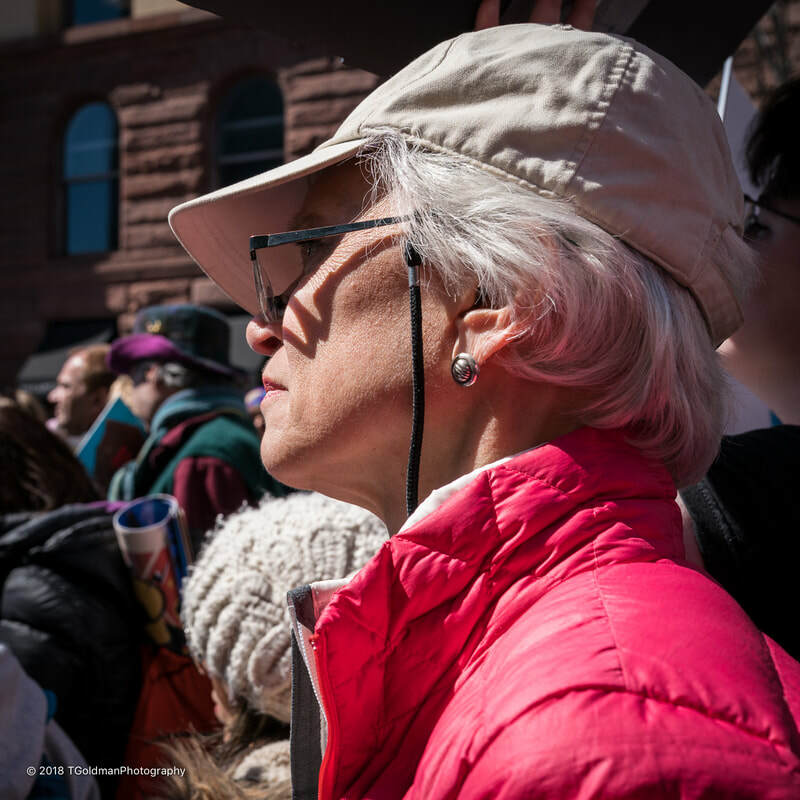 This photo essay shares my experience on the day of the march. ​After the Sandy Hook Elementary School shooting took the lives of 20 babies and 6 adult staff members, and after President Obama wept for the victims and their families, surely things would change. 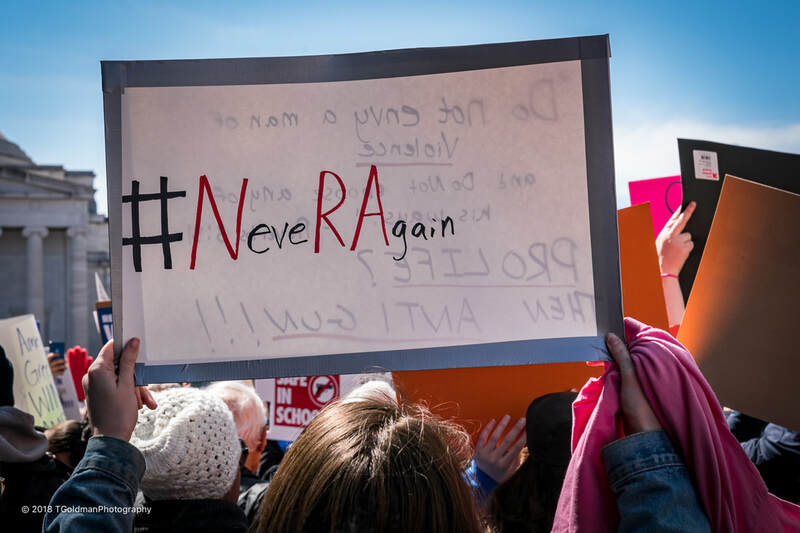 Surely those who hold their rights so dear under the Second Amendment to the United States Constitution- surely they would finally realize that too many lives are being lost to gun violence. 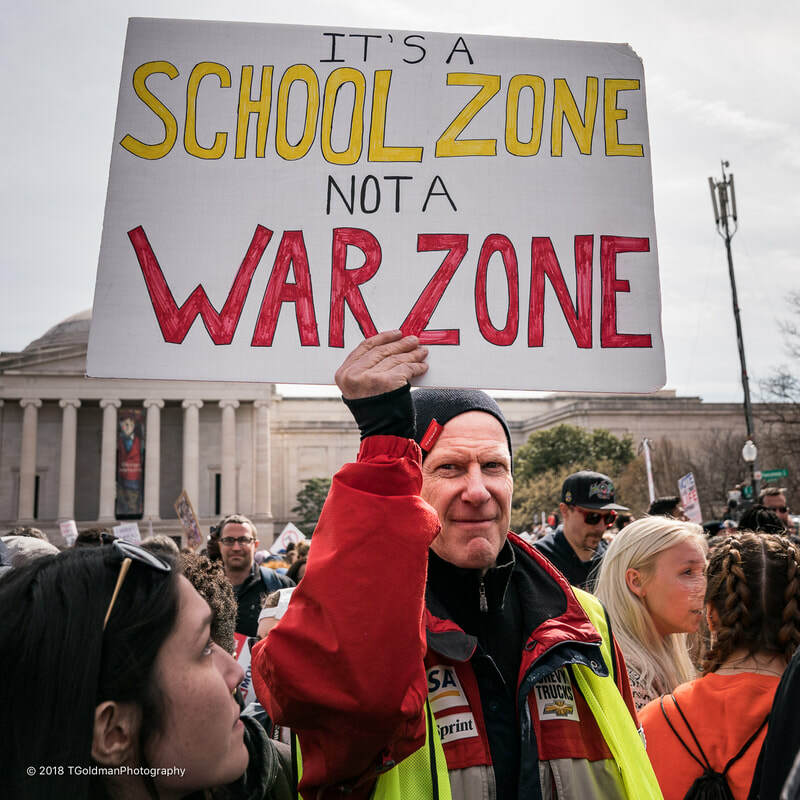 Surely they would relent and allow common sense gun safely laws to be enacted and would agree that weapons of war should not be in the hands of civilians- surely they would, but surely they did not. 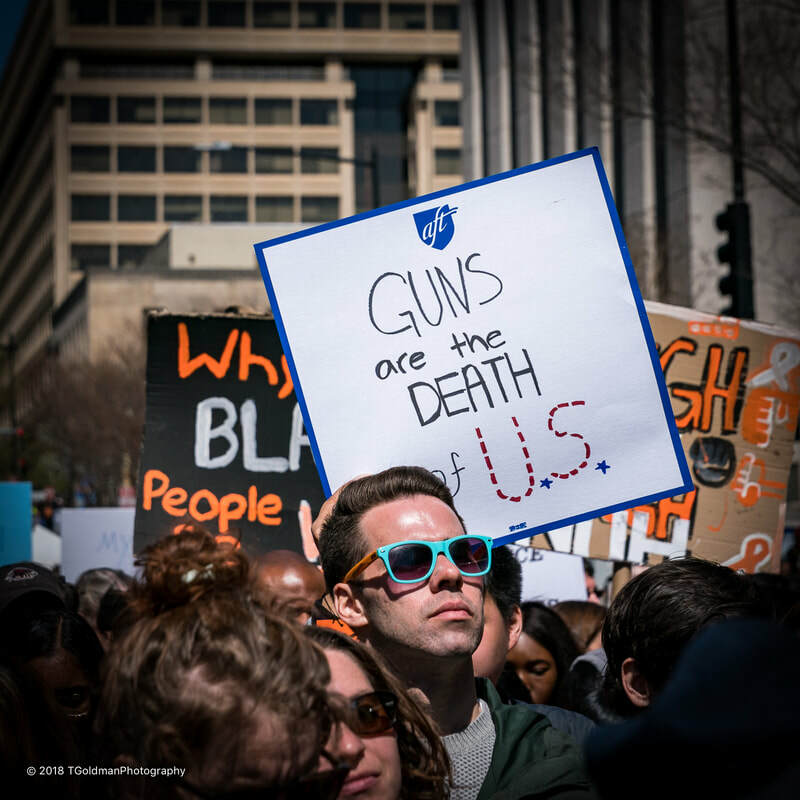 Our representatives acceded to demands of the gun lobby and their money, and the massacres continue. But maybe this time will be different. Neither those who cherish their guns nor our representatives go about their days feeling that they are being hunted, but school children do. 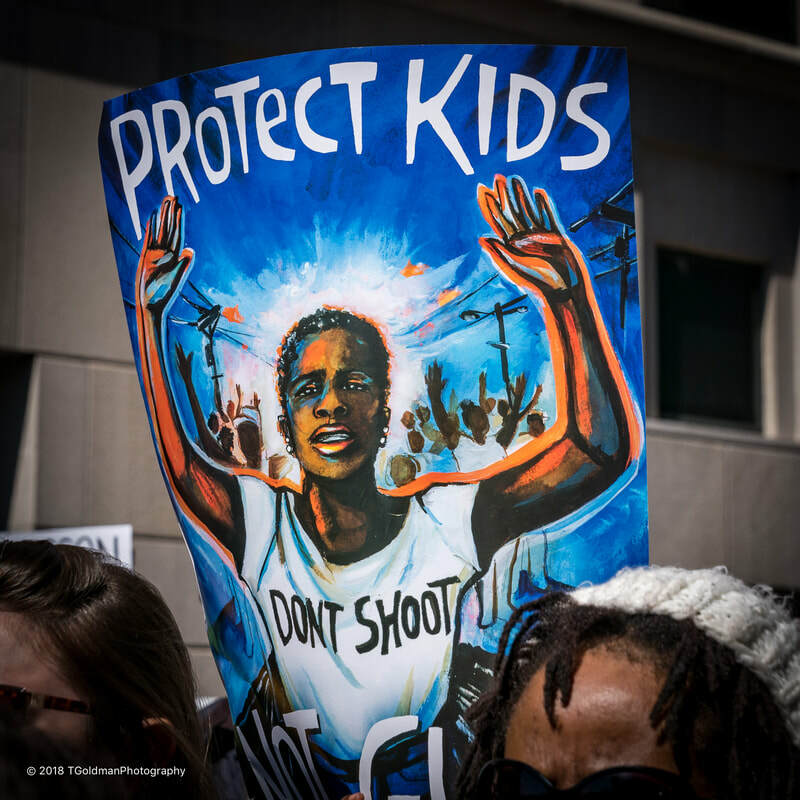 Will the powerful and articulate voices of these kids finally make a difference? Their voices are not owned by contributions or fear of losing their power. Their voices only speak for the desire to stay alive. 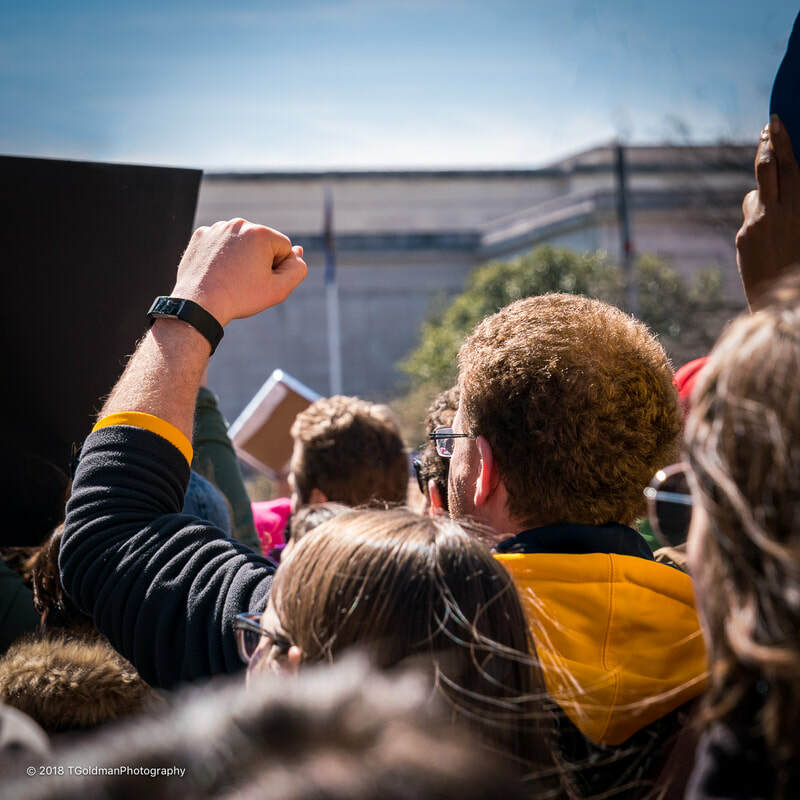 This photo essay presents images of what I saw at the march. I hope it will bring readers closer to the emotion of the day. But it in reality it only takes five images to tell the story and these are presented here. ​A mother clutches her daughter in fear that she will be next- symbolizes what so many parents feel today when they send their kids off to school. 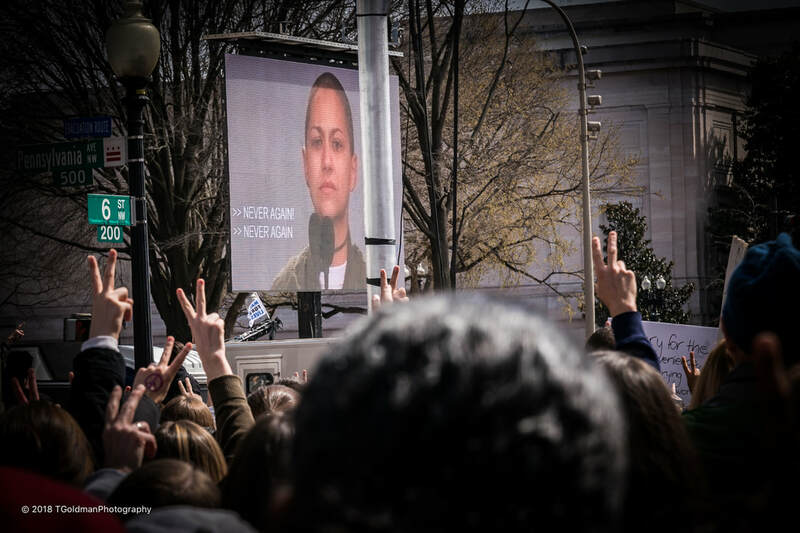 ​Emma tells the crowd: NEVER AGAIN; NEVER AGAIN! 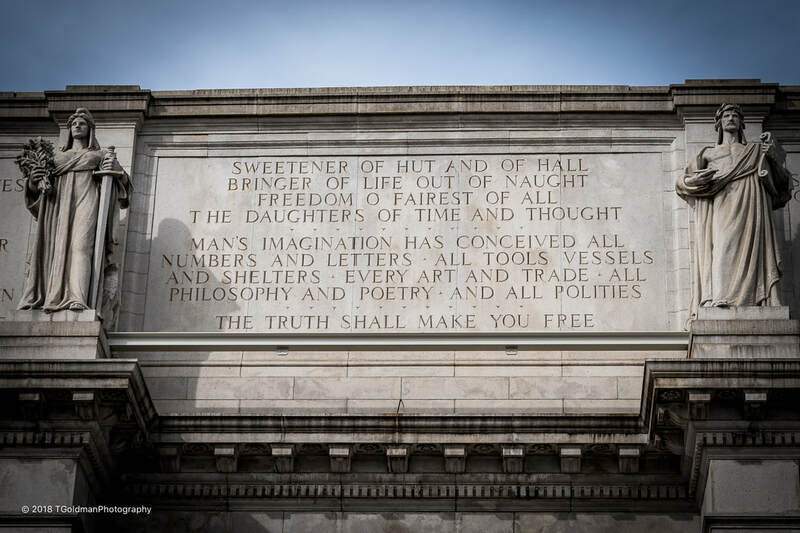 ​The inscription over the main entrance to Union Station in Washington DC reminds us that mankind has created everything including “All Tools”, such as guns, and “All Polities”, such as organizations like political parties, the NRA and March For Our Lives… Somehow from this conflict: “The Truth Shall Make (Us) Free”. ​Students hope to find their truth at the ballot box beginning in 2018. 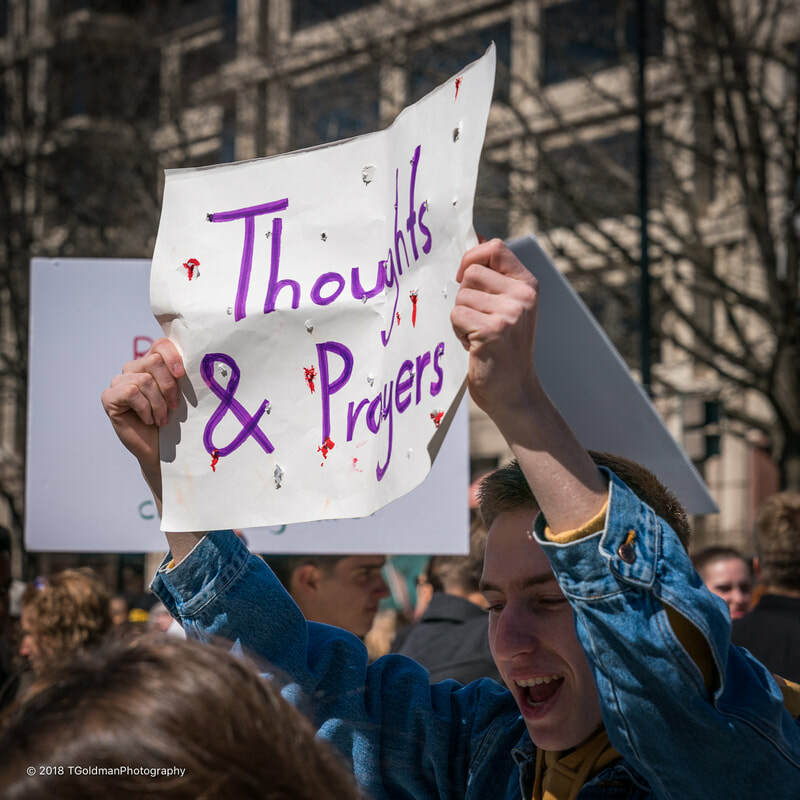 ​But will the energy of this movement prevail, or will it end up in the trash bin with all the other efforts for common sense gun laws? ​After leaving Union Station I followed the crowd West and then turned South on 6th street. 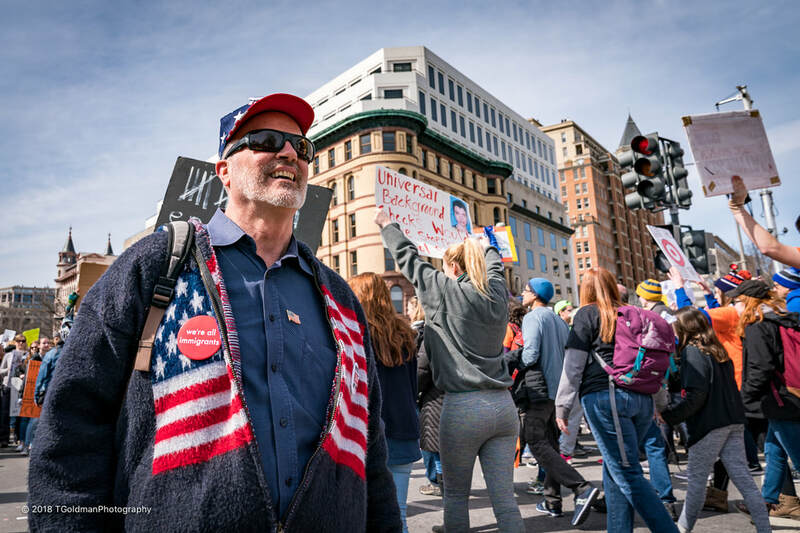 I went as far as I could until getting wedged in near the intersection of Pennsylvania Avenue where I stood from noon until 3:15pm. There were loud speakers and a large monitor which made it possible to follow the program. ​Facing South on 6th Street towards the National Gallery Of Art. ​Facing North on 6th Street towards the people behind me. ​As an admitted news junky, I listen to politicians speak all the time. No matter what side of the question they’re on, they speak in very measured tones- so quiet: “Maybe we should do this…”; No, this isn’t the right time…”; “We’ll take it under consideration…”. But these kids spoke in screams and absolutes: “NEVER AGAIN”! 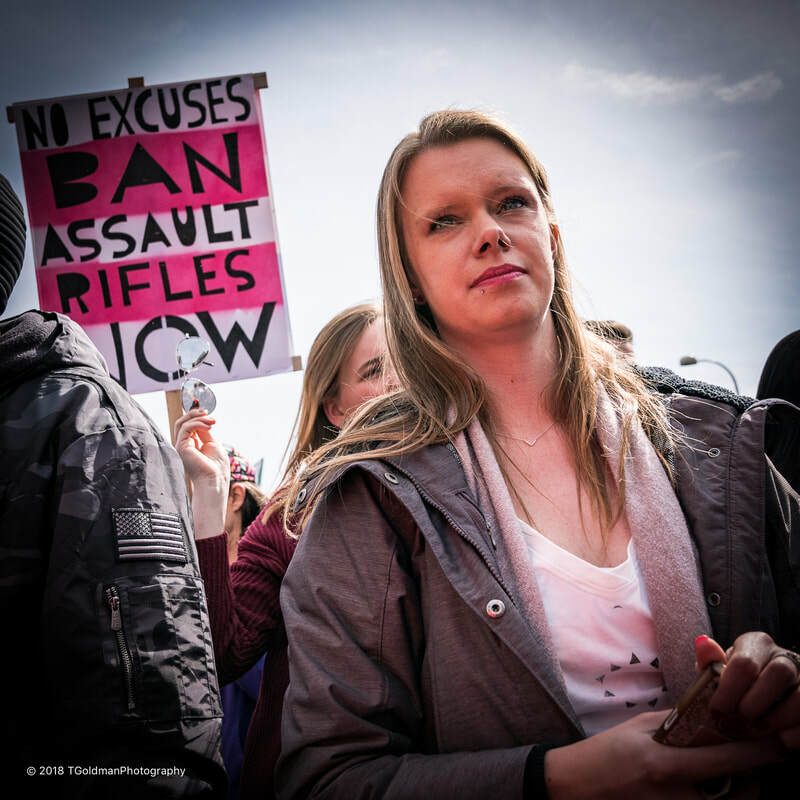 It was loud enough that politicians, who just happened to be out of town on March 24th, surely heard these voices- surely heard that they are in the bull’s eye of these student’s most powerful weapon. Their weapon is not automatic, doesn’t have large capacity magazines, cannot take a bump stock. Their weapon offers only one round per person, a single ballot- and there’s a wave coming! ​The crowd showed its solidarity. ​Those preferring their unabridged rights rather than saving lives made an appearance as well. ​“I'll give you my gun when you pry it from my cold, dead hands!”… That’s no act. 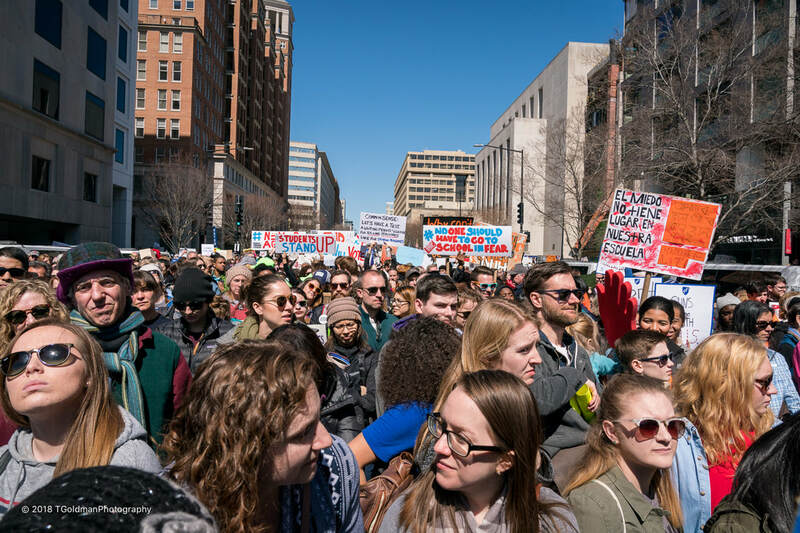 ​March For Our Lives will surely drive sales. ​Marchers expressed themselves with their signs. ​Voter registration was everywhere- they mean business. 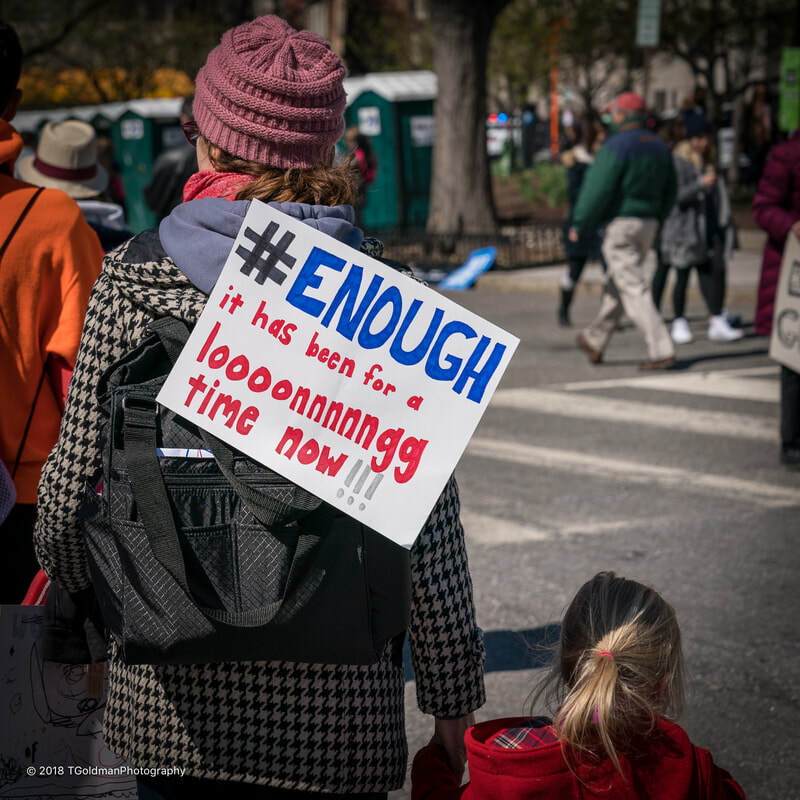 ​“ENOUGH” was a rallying cry. 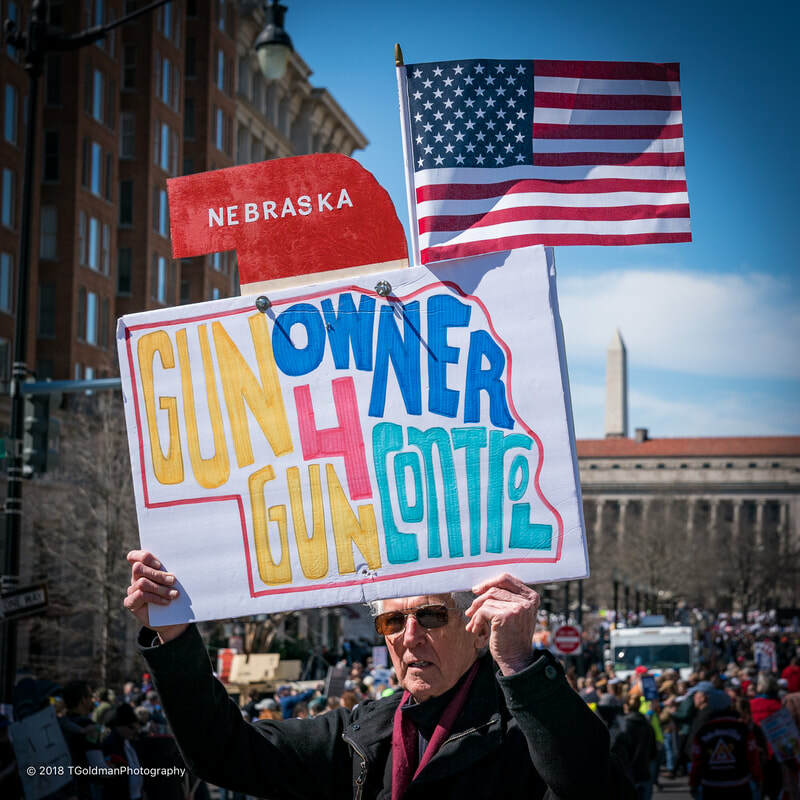 ​Even gun owners took a stand. 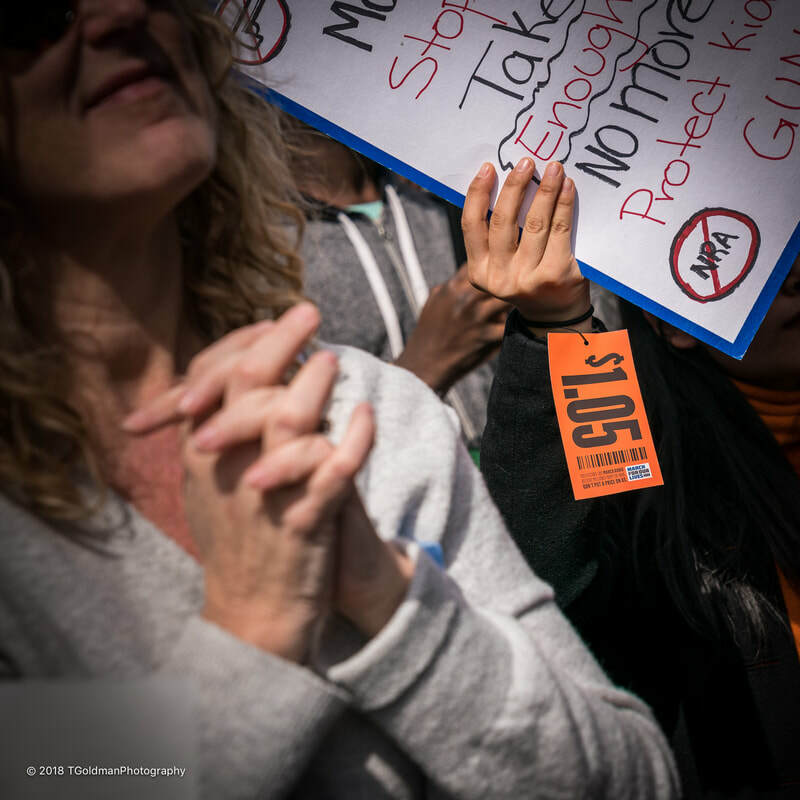 ​“NOT ONE MORE”, but there are more: 96 people die from gun violence every day (Brady Campaign to Prevent Gun Violence). ​So many creative ways to say: NEVER AGAIN. ​There were several attempts to value a child’s life. 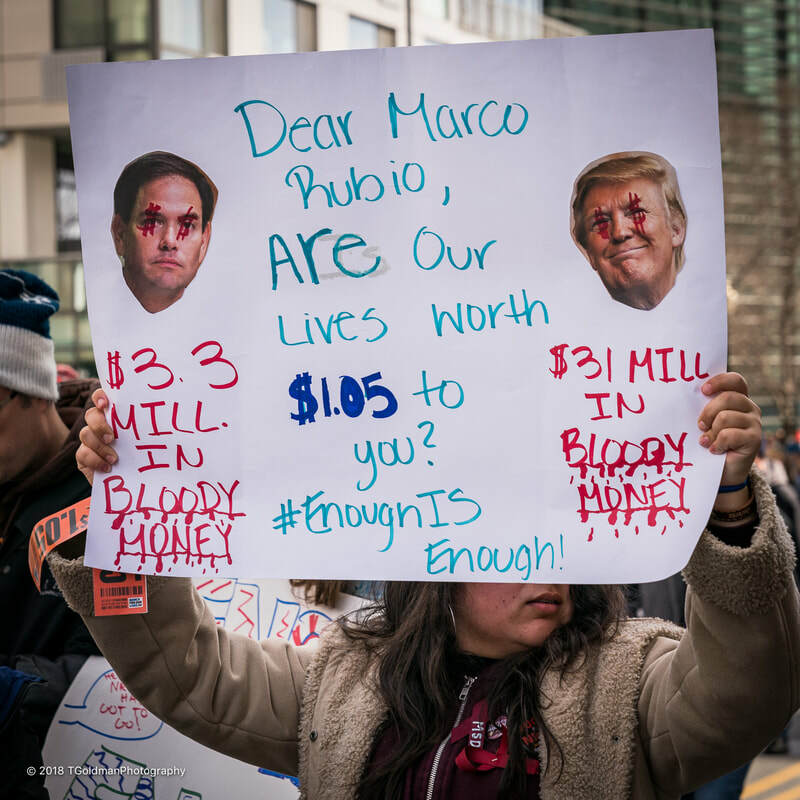 ​$1.05 per life: the amount of money that Marco Rubio is said to have taken from the NRA divided by the number of students in Florida; many people wore orange $1.05 tags. 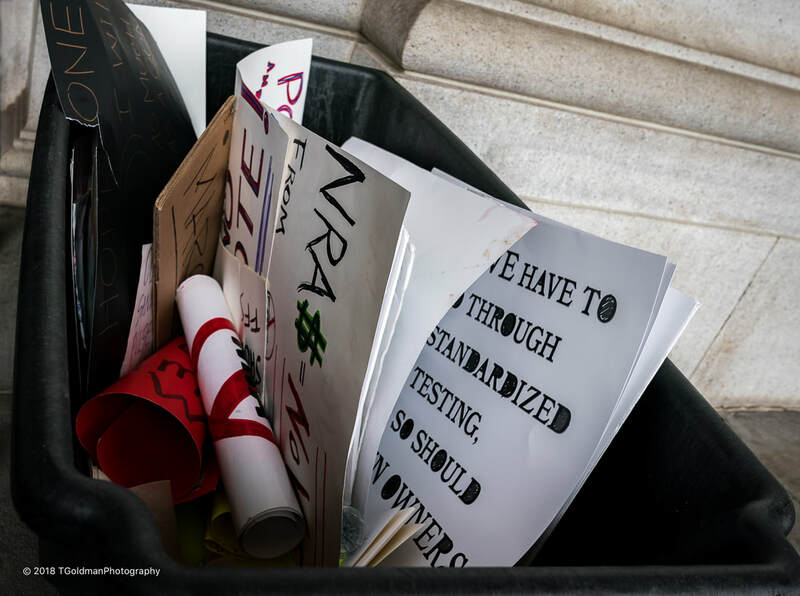 ​The NRA and Republicans were the focus. ​Connecting with the Women’s March. ​If all else fails, try logic. 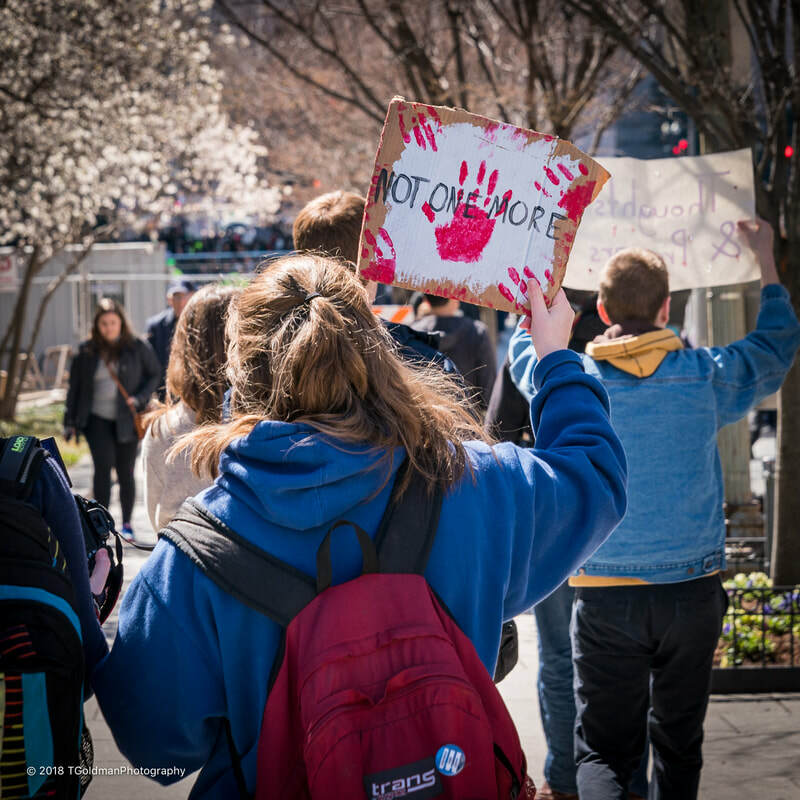 ​“Hands up, don't shoot”; one of the many connections made between inner city and suburban gun violence- the result is the same. 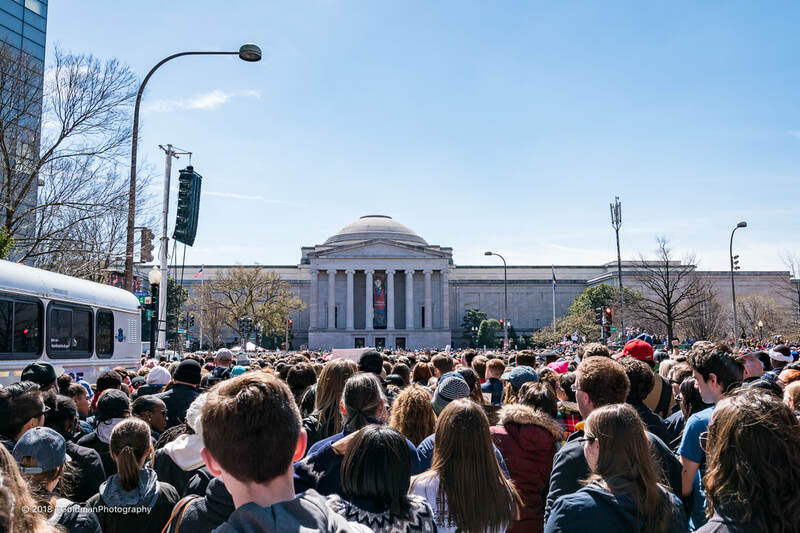 ​March For Our Lives was hundreds of thousands of hugs. ​There’s no doubt about the role of teachers. ​Or the role of school. ​Double entendre- sign makers showed their creativity. 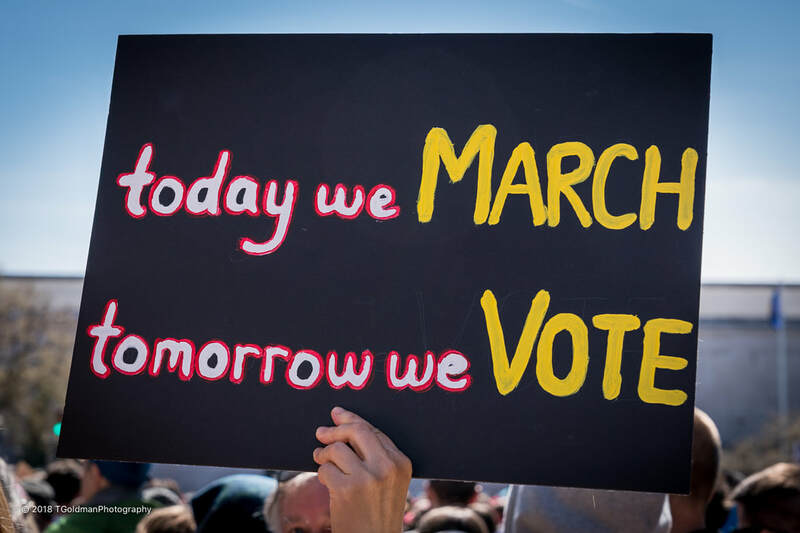 ​People who want change will soon stand at the ballot box. ​November 6, 2018 to be exact. ​People came from far and wide to share this experience. Here are some of the people I saw. They don't even need signs to make their point. ​Not good to feel like $1.05. The next salvo will be to attack these kids who are asking for no more than staying alive… A former United States Senator symbolized the opposing view when he said on the day following the march: “How about kids instead of looking to someone else to solve their problem, do something about it maybe taking CPR classes or trying to deal with situations that when there is a violent shooter that you can actually respond to that.”... Really? I’m certainly no scholar of history, but it seems that societies eventually move towards human rights and social justice, though it can take a very long time and many people die in the process. The move from slavery to full equality for African Americans has been a work in progress for 400 years- so much has improved, but still so much more to do. Women’s rights have been building for the last 100 years- the glass ceiling is ready to fall, but it needs to fall now. 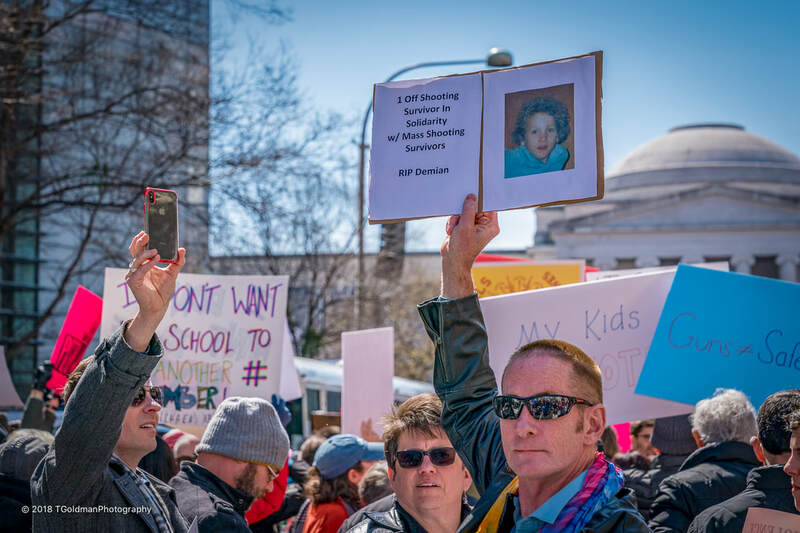 LGBTQ rights are building very quickly- but there are still occasional laws and pronouncements that can only be described as mean. 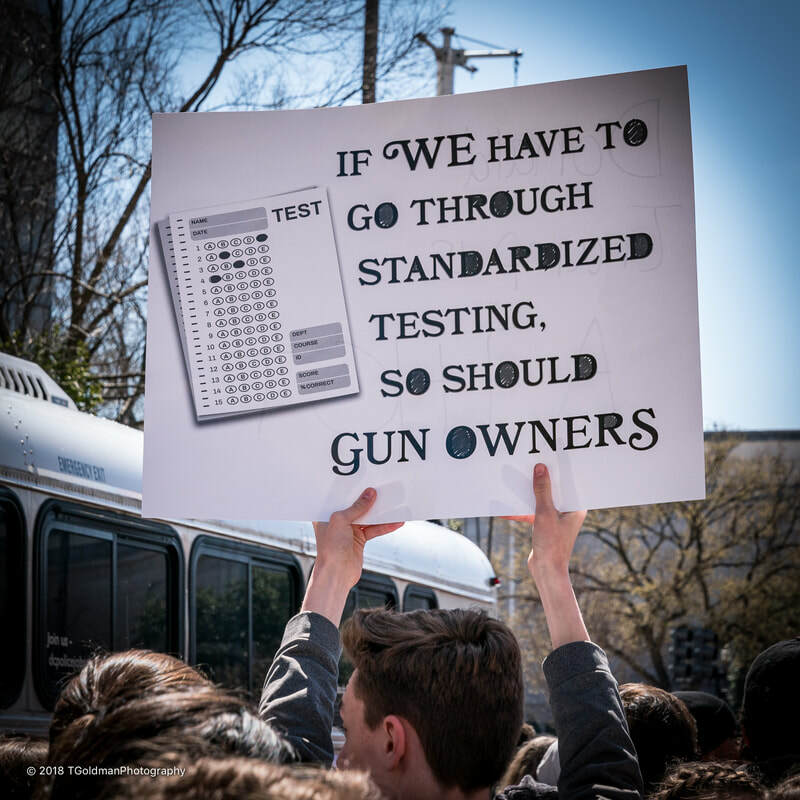 But I have no doubt that the day will come when people in the United States will walk the streets, go to malls, go to the movies, and go to school without the fear of being killed by a “bad guy with a gun”. ​Finally, I was wrong in the introduction when I said it only takes five images to tell this story- it really only takes one! And that’s “The Story Within The Story”! © 2011-2019 TGoldmanPhotography LLC. All Rights Reserved. Images and Content May Not Be Reproduced Without Written Approval.